To say that Tibetan exiles live in a small world would be an understatement. Ours is a world where any two people chosen at random are bound to have several common friends (and sometimes, a few common enemies). Whoever postulated the ‘six degrees of separation’ theory clearly never did any field work in Tibetan society, where one degree of separation is the norm. The extraordinary smallness of the Tibetan world, now made even smaller by social media, renders authorial disclaimers redundant. Everyone knows who is a friend (or foe) of whom. And yet for the sake of formality, here’s my disclaimer: Lukar Jam is a friend of mine. Well, there you go, I’ve said it. Aside from the fact that we are fellow activists in the struggle for Rangzen (Tibetan independence), I count him among my numerous eccentric friends many of whom, like Lukar, happen to be starving artists, hopeless poets, and barefoot activists. In August, Lukar made a big splash in the small pond of Tibetan politics when he joined the race for the post of Sikyong, or Prime Minister, in the upcoming Tibetan elections. As a prominent exponent of Rangzen, his entry into the race enthralled many supporters of Tibetan independence. However, in conservative Tibetan circles, it provoked laughter at first, then ridicule, and later a creeping fear. In their eyes, Lukar is not only pro-Rangzen but also a harsh critic of the Middle Way policy, a conciliatory approach introduced by His Holiness the Dalai Lama that seeks Tibetan autonomy rather than independence from China. On social media platforms – a parallel universe that can sometimes feel more real than the real world for stateless exiles who have lost their sense of territory – there was an avalanche of insults and denunciations against Lukar. Many Tibetans were terrified by the specter of a Lukar Prime Ministership, and called him all kinds of unprintable names. Predictably, they also slapped on him the more printable and less erasable tag, “anti-Dalai Lama.” In Tibetan society, this label can get you ostracized for life. Even the Speaker of the Parliament, Mr. Penpa Tsering, who is also running for Sikyong, declared that he would not participate in any debate or forum where Lukar is also present. At first this undemocratic statement shocked me, because the word on the street is that Penpa la is usually considered far more liberal than most of the Dharamsala politicians. But under closer analysis, I began to suspect that this was partly a calculated move by the Speaker to avoid having to engage with a formidable debater, and partly a premeditated soundbite aimed at appealing to the masses of faith-driven voters. Why did Lukar’s candidacy put so many people on edge? In fact, why is he held in contempt by so many conservative members of our society? Where does his notoriety come from? I met Lukar in 2007, when he was already a controversial figure in Dharamsala but not as reviled as he is today. We had tea at Hotel India House Restaurant (yes, that really was the name of the restaurant). I asked him several questions about the state of the resistance inside Tibet, as I often do with people who grew up in Tibet. His answers were always thought-provoking and often unpredictable. It became clear to me that he was not only well read but also one of the most original and unorthodox thinkers in our community. Since then I have met with him occasionally during my visits to India. We chat over tea (any tea but Am-cha, please) or over nomad-style boiled meat. This is not to say that we agree on everything, although his detractors would like to put all Rangzen advocates into one box as if we were identical products manufactured at the assembly line. The truth is, I vehemently disagree with him on a number of issues. For example, I believe deeply in the strength of strategic nonviolence to effect fundamental change even under the most forbidding circumstances, while Lukar is dismissive of the power of nonviolence. Influenced by revolutionaries like Che Guevara, he believes that violence as a potential method of resistance should not be ruled out. On the contrary, I insist that violence is strategically unnecessary because of the overwhelming empirical evidence that nonviolent resistance is twice as likely to succeed as armed struggles. Another disagreement I have with Lukar is more relevant to the topic at hand. Lukar has said in public that in the calculus of international politics, anyone who concedes the struggle for Rangzen will be considered a traitor. In my opinion as a political science student, “traitor,” even in its most expansive conception, is the wrong word to define people who lower their sights from independence to autonomy out of desperation, especially when the country in question had been lost half a century ago. By making such hyperbolic statements, Lukar the provocateur is letting down Lukar the Sikyong contender, not to mention many of his supporters. My disagreements with Lukar do not end here, but neither does our friendship. Actually our discussions are more enjoyable and fruitful precisely because we have different opinions. Tragically, Tibetan society today has lost its ability to embrace intellectual differences and accommodate ideological disagreements. Driven by two false assumptions – that China would resolve the Tibet issue if all Tibetans agreed with each other, and that unity is founded upon uniformity – the conservatives among us have sought to isolate anyone who voices an opinion different from the mainstream narrative, especially when that opinion appears to be at odds with that of His Holiness. As a result, the whole exile population is being split into two sides: the Middle Way camp and the Rangzen camp. Ironically, some of the most polarizing words and malicious tactics in recent memory have been used by conservative fundamentalists in the name of advancing the Middle Way. This false dichotomy has turned both sides into caricatures of themselves, demonizing each other, unable to see that they are both located along the same continuum. In the process, those in the real middle – the non-ideological public who do the grunt work for the movement – are confused, tormented and disillusioned. Amid this tense atmosphere, many Tibetans fail to see the humanity of Lukar’s personality and the complexity of his candidacy. Where does he stand on women’s rights? What are his views on the exile education system? Does he support Tibetans applying for Indian citizenship? If elected, what concrete steps will he take to advance the struggle? These are important questions, but alas no one will hear his answers. Detractors of Lukar, in a masterful stroke of campaign politics, have already painted him as “anti-Dalai Lama,” and that’s the only frame through which the public will view him. But what has Lukar actually said that has led people to call him “anti-Dalai Lama”? The most specific accusation against Lukar to date is the allegation that he has referred to His Holiness as largen, a term that means “senior monk” or “older monk”. Most people, however, have misunderstood this word to mean the less reverential “old monk.” As irreverent as the term sounds to many of us, Lukar has clarified that in his native Amdo dialect, largen is a neutral word and not a derogatory term; some have even pointed out the respect that is tacitly implied in the term “senior monk.” At any rate, the fact that this one word has become the focal point of the anti-Lukar campaign only highlights the bankruptcy of the charges against him. The damage is done, however, and no amount of clarification can prevent Lukar from sinking in the quicksand of ignominy, dragging along any one who tries to save him. Such is the nature of politics, and all who step into the ring must accept that fate. Nevertheless, it pains me to see my own community demonize a person who almost died in Chinese prison for his principles and for his nation. A more persistent source of Lukar’s notoriety is his relentless critique of the Middle Way approach. But many Rangzen advocates often critique the Middle Way approach without suffering political concussion. Even the most high-profile interpreters of the Middle Way have privately expressed doubts about its effectiveness or relevance. Just criticizing the Middle Way does not automatically make someone “anti-Dalai Lama,” not least because the main overseer of the Middle Way for more than a decade has been the Tibetan government, not His Holiness. Some Tibetan elders have privately confided to me that they do not approve of our community’s vilification of Lukar. However, what makes them lose sleep at night is the fear that Lukar’s words may undermine young Tibetans’ faith in His Holiness. While their fear is understandable, it has no basis in reality. On the contrary, this fear exposes how little they know about the resilience of young Tibetans’ devotion to His Holiness. I have never met a single Tibetan whose faith in His Holiness has been compromised by coming in contact with anything said or written by Lukar, or anyone else for that matter. To be sure, as His Holiness advances in age, more young Tibetans are beginning to see His Holiness as a human being rather than a divine figure. This should not alarm our elders. Recognizing the Dalai Lama’s humanity, far from diminishing his divinity, allows us to fully appreciate the crushing weight of the burden that he has carried for us all these years. To insist that His Holiness is infallible and superhuman is to trivialize the monumental effort that has gone into his extraordinary achievements. Therefore, when institutions like the Ganden Monastery tries to muzzle Lukar Jam by denying him a platform, they are doing a disservice to His Holiness. In their clumsy effort to protect His Holiness from any hint of criticism, they end up promoting intolerance and bigotry in our community. His Holiness has built a legacy of tolerance, dialogue and compassion, and the conservative segment of our society must not let its own small-mindedness suffocate His Holiness’ great legacy. Lukar is a complicated person. Though humble and incorruptible, he is not immune to mild delusions of grandeur. But for someone with a healthy ego, he rarely talks about himself. It takes a fair amount of prodding before he opens up about his experience as an underground organizer for Tibetan freedom in his youth and later as a political prisoner. A man of ideas, he prefers discussing history, philosophy, and poetry. He never talks ill of others, even of those who had engineered his transformation into the Frankenstein of Dharamsala. His greatest quality – and also his greatest weakness – is that he is devastatingly honest. He presents the truth in its starkest form, with no cushioning to soften the effect. When he calls for secularism in Tibetan politics, for instance, he cloaks his message in the harshest language possible. Unfortunately, the harshness of his language gives his detractors the ammunition to attack him and undermine the prescience of his message. Even to those who agree with him, he may seem like almost the wrong messenger for the right message. Not surprisingly, even among Rangzen advocates, many find it hard to imagine Lukar as Sikyong. While every Lukar supporter is almost certainly a Rangzen advocate, not every Rangzen advocate is a Lukar supporter. Many Rangzen sympathizers find Lukar too radical and worry that a Lukar administration might turn the Tibetan world upside down. More damagingly, many Rangzen supporters are under the false impression that Lukar is against His Holiness. They will vote for anyone but Lukar. For all my disagreements with him, I applaud Lukar’s candidacy in this election. And his unflinching advocacy of Rangzen is not the only reason why. I believe that Lukar’s candidacy can be a testament to the progress that Tibetan democracy has made. For the first time, a candidate has emerged who publicly champions views different from those maintained by the establishment. This partial realization of the concept of a loyal opposition makes Tibetan democracy worth its name. Lukar’s candidacy does not endanger what some perceive as “our fragile democracy.” On the contrary, his dissenting voice makes our democracy more robust and genuine, in keeping with the vision His Holiness laid out decades ago. I applaud Lukar’s candidacy also because he stands for secularizing Tibetan politics. Oracles like Nechung have served the nation for centuries, and it’s time to retire them with dignity – and a generous pension of good karma. Moreover, in the wake of the Jhonang protests at the Tibetan Parliament in Dharamsala, our government would be well advised to simply eliminate the parliamentary seats reserved for religious sects – “one person, one vote” should be our mantra, whether the voter is lay or monastic. It is only by embracing secularism that we can safeguard religion from becoming a political tool, and protect politics from getting hijacked by religious sectarianism. 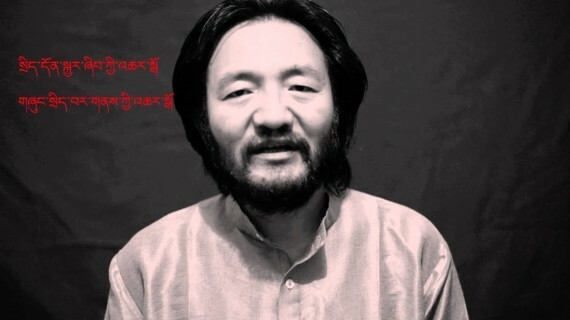 Whether Lukar wins or loses the race for Sikyong, his true campaign vision is far grander than any political project: it is to awaken Tibetan society from the slumber of servility, to liberate the new generation from the shackles of dogma, and to launch a secular renaissance in Tibetan culture. I, for one, will not begrudge him his occasional delusions of grandeur. Originally published in the Tibetan Political Review.